Happy Bloggers Challenge Friday! Thanks to those who played along with the Pennants or Fishtails Challenge! The challenge this week is Quotes. I love to use Quotes on my projects, today, I'm using one of my favorite quotes from the Artistic Outpost Typography plate. 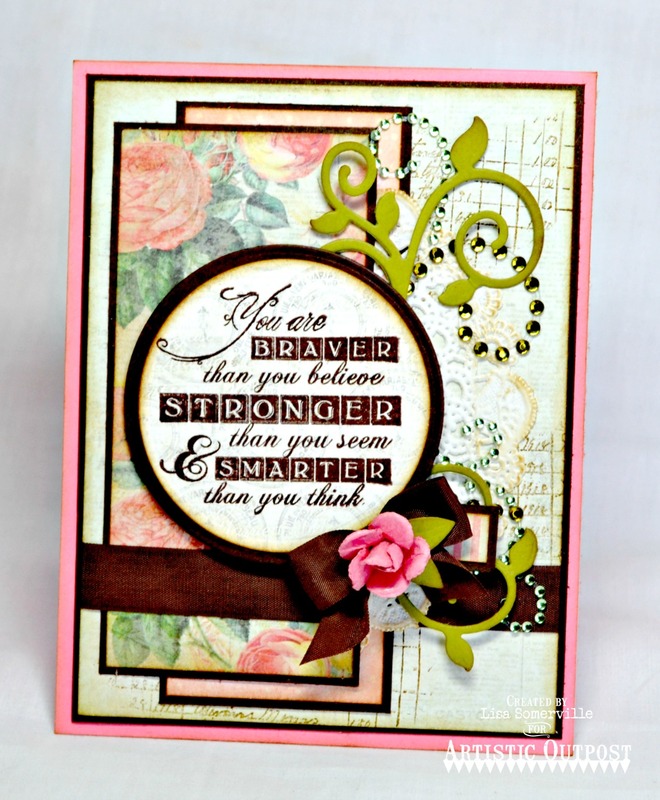 Inspired by the Mojo Monday Sketch Challenge, I created the layers on my card using Our Daily Bread Designs Blushing Rose Paper Collection, stamping the larger panel with the Artistic Outpost Ephemera Background Stamp, then layering the panels on Espresso card stock. The quote from the Typography plate is stamped in Espresso on a scrap of the pattern paper, then die cut using Spellbinders Circle Dies and layered on an Espresso Circle. To embellish I added Zva Creative Crystal Gems, a Mini Rose, Doily, Vintage Brown Seam Binding and die cuts using the ODBD Custom Fancy Foliage Die. If you didn't hear the news, Artistic Outpost is now open under new ownership! You can read more details here on the Artistic Outpost Blog! If you'd like to play along with this weeks Bloggers Challenge, please link back to this post on your blog and mention you created your card for the Bloggers Challenge Quotes Challenge. Please add your link using the Link Tool below, your link should be a direct link to your Bloggers Challenge Post, use your name as the Title. Please do not link to cards that were created prior to the challenge date. Entries not linking properly, or backlinked will be removed. If you have the captcha enabled on your blog, please consider turning it off, as it makes it so much easier to leave comments. This is beautiful, Lisa! I love all of the embellishments you added to draw attention to the quote. Beautiful quote on an amazing card!